The red panda (Ailurus fulgens) is a fluffy species of mammal that looks somewhat like a cross between a raccoon and a traditional teddy bear, if such a whimsical hybrid could actually exist. Red pandas are remotely related to the world famous giant panda species, although they are significantly smaller than the latter. These reddish and white animals come from central China, Myanmar and parts of the Himalayan mountains. Red pandas are herbivorous animals, according to National Geographic. The main staple of the red panda diet is bamboo, similar to giant pandas -- approximately two-thirds of their diet is made up of the stuff, says Blank Park Zoo. Other typical components of their diet are bamboo foliage, other foliage, bird eggs, lichens, blossoms, acorns, mushrooms, berries and grasses. Occasionally, they dine on tiny rodents and birds. During the warmer months of the year, red pandas consume a lot of bugs and fruit, too. Red pandas differ from giant pandas in their manner of eating bamboo. 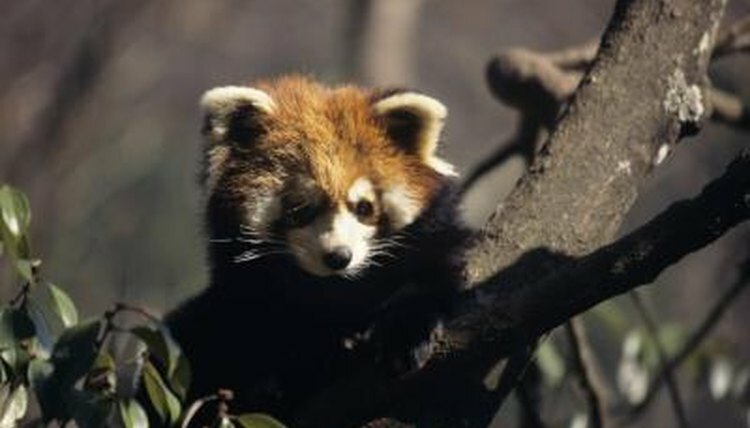 Red pandas are selective about the parts of bamboo they eat, only going for the newest and softest foliage and stalks. Giant pandas consume the entirety of the plants, other than the roots. Red pandas are also diligent chewers, while giant pandas are not. The meek mammals are capable of eating bamboo with ease due to their powerful jaws and large teeth. Both of these factors are helpful for munching on bamboo. Both red and giant pandas possess convenient protrusions on their wrists that enable them to grasp onto shoots. Red pandas that live in captive environments -- think zoos -- eat very similar diets to those in the wild. The typical red panda zoo diet consists of elements including the obligatory bamboo, yams, dry dog food, berries, grubs, fresh fruits, grasses and leaf eater biscuits. The fruits that red pandas are usually fed include apples and grapes.